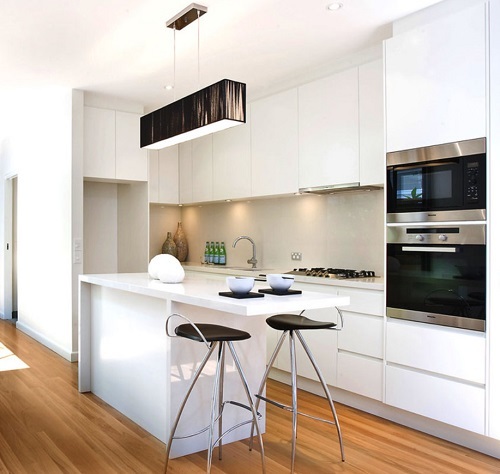 The way kitchens and dining rooms are designed has changed a lot in the last decade, shifting from away from separate, formal eating spaces to more casual in-kitchen dining – usually in the name of having barrier-free rooms that keep the family more connected around mealtime. That said, every family is different, and the way you set up your kitchen and/or dining room should be informed by how you actually use the space, and designed to facilitate the kind of dining experience you want. There’s no one right answer: a busy family that tends to eat on the run is going to need a different setup than one that eats multiple meals together every day. When most people talk about dining rooms, what they mean are very traditional separate dining rooms, with long rectangular tables and enough dining chairs to seat eight to twelve people. 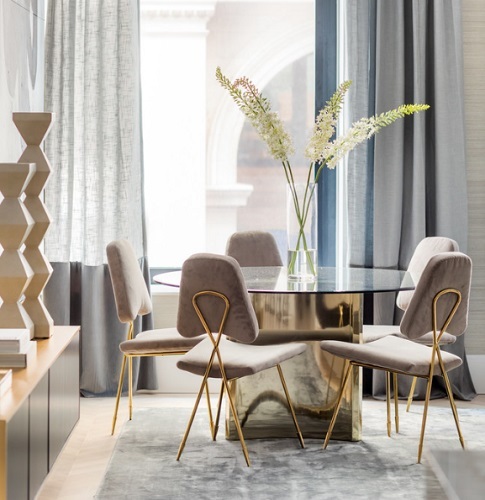 But while having a dedicated, dressy space to host guests is historically a must-have, in many contemporary homes, they go unused for anything but holidays, which makes them a waste of space. That said, big, grand dining rooms are great for people who do a lot of entertaining. If you host large groups on a regular basis and don’t want them flooding your kitchen while you cook, a traditional dining room is a tried-and-true way to do it. Otherwise, consider scaling down a little. A six seat table with a removable leaf can be expanded for hosting a group, but has a more relaxed, casual feel if you want your family to use it on a regular basis. 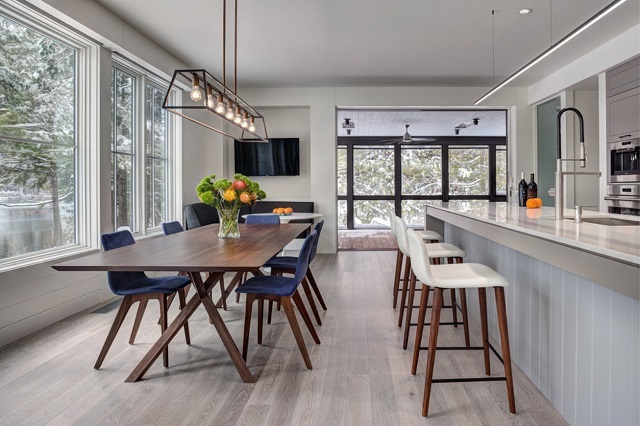 In the last few years, kitchen island seating has become the big contender to traditional dining rooms, and is more or less a modern re-purposing of the same idea. Formal dining rooms separate guests from the kitchen, keeping cooking messes out of sight, but also keeping the cook away from the party. Kitchen island seating brings family and guests directly into the kitchen during food prep, so no one’s left out while doing the dirty work. In modern greatrooms, it also keeps the kitchen, eating, and living areas all in visual and talking distance, so you can host a crowd without having everyone sitting down at a single table all at once. This type of setup also makes it possible to keep an eye on the kids while you’re busy in the kitchen, enabling you to snag a little family time even if you’re in a rush. That said, seating is limited by the size of your island, and while it’s great for large group socializing, it can make it harder to have an unplugged, sit-down, face-to-face dinner on an average night. Growing up, I remember almost every kitchen having a kitchen table – distinct from the separate formal dining table in that it was small, meant for eating at every meal, and – let’s be honest – usually piled with mail and odds-and-ends. Kitchen tables as such have since fallen out of popularity, and have been largely replaced by some combination of casual dining tables and kitchen island seating in open, barrier-free spaces. 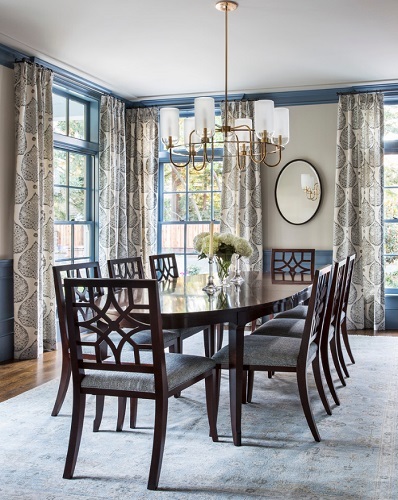 Knocking down the walls that separate your dining room but keeping a formal dining set intact allows you to have the best of both worlds: plenty of face-to-face seating in a more relaxed setting that encourages socializing. 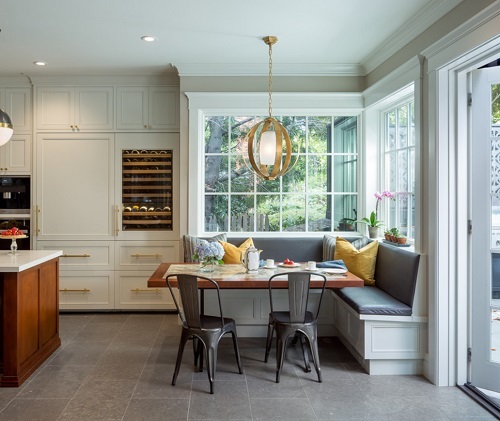 One option that’s risen as a popular substitute for kitchen tables is the classic banquette or breakfast nook. Rather than having a free-floating table, these are built into the kitchen, usually with a combination of bench and chair seating, and can stand on their own or be supplemented with separate island seating or a dining table. Banquettes have the intimate, face-to-face sit-down feel of kitchen and casual dining tables, but the more comfortable bench-style seating makes them a nice place to just relax, which is a great way to encourage kids to spread out and do homework where you can keep an eye on them while you’re in the kitchen. Banquettes are also great for seating a crowd, since bench style seating lets you scooch in and make space for more people in a way you can’t with a traditional dining table. If you and your family do do most of your eating at a separate dining table (whether it’s in its own dining room or part of a larger greatroom), that doesn’t mean you can’t have fun with some of the other types of seating mentioned here. While I’ve certainly seen kitchen islands with an army of bar stools lined up along one edge (as many as ten or twelve in really big kitchens! ), you can easily design an island that only has one or two seats. Ditto for banquettes and breakfast tables: if your kitchen doesn’t have room for a full sized kitchen table, it might have room for a bar table or tiny breakfast nook. While you won’t do most of your big meal-eating at these tables, they’re wonderful for enjoying a slow morning with a loved one, or just giving yourself a spot to take a breather during food prep. Having so much flexibility in how to structure your kitchen and dining areas means that a lot of traditional dining rooms are getting overhauled and re-purposed – as game rooms, libraries, home offices, music rooms, and more. But there’s one conversion that I think is particularly worth pointing out here: using your dining room to entertain, but not necessarily for a big meal. Sometimes, it’s nice to be able to gather a group around a table – to talk, to snack, to play games – and big, round tables are better across the board for basically any face-to-face, sit-down activity that isn’t eating. Round tables are also great for light meals (like tea or brunch) that are heavy on the conversation – you sacrifice a little bit of the table surface, but will have an easier time engaging with everyone around the table rather than just the people next to or across from you, and can enjoy the relative privacy of a separate, dedicated room. For better or for worse, the way we eat is shaped by the spaces we make to eat in, and vice versa. So if you’re looking to update your kitchen and dining room, take the time to really consider what you want and need from the space to ensure you create something that will serve you well. This entry was posted in Decorating Ideas and Tips, Dining Room Furniture and Decor, Kitchen, Latest Trends and tagged banquettes, breakfast nooks, dining rooms, formal dining rooms, great room design, kitchen island seating, kitchen tables.